This page shows how enterprises can deploy the proxy package provided by Agora to access Agora’s services through a company firewall. This page does not apply to the Agora Web SDK. Enterprises may restrict employees’ access to unauthorized websites through a company firewall, and can deploy the proxy package provided by Agora to enable access to the Agora Cloud for Agora’s services. Agora provides an open-source proxy package for enterprises to downland and deploy. Go to https://github.com/AgoraIO/Tools/tree/master/Proxy/proxy-for-rtc-sdk, download, and install the install-ubuntu.sh script. Add relevant IP addresses and ports in the enterprise firewall to allow access. Call the following method in the Agora SDK, and set the IP and port parameters in the method. IP IP addresses that you want to add. The IP addresses are strings. For example 127.0.0.1.
port Ports that you want to add to the Agora proxy. Enter 1080. Enterprises can deploy multiple proxies to enable uninterrupted access in case the proxy server is overloaded or breaks down. Agora has yet to conduct tests on the capacity of the proxy, but estimates are that one proxy can support around 100 users. The proxies share a single domain name. The proxies use a round-robin system to ensure load balancing. Update the DNS log whenever the proxy breaks down. The app can randomly choose which proxy to use, and then pass it to the SDK. The enterprise sets up a firewall that separates the enterprise network from the public Internet to limit employees’ access to unauthorized websites. The enterprise deploys a proxy on the public Internet. When an enterprise device accesses the Internet, the device sends a visit request to the enterprise firewall, which then sends the request to the proxy. The proxy then sends the request to the public Internet server, like a relay. 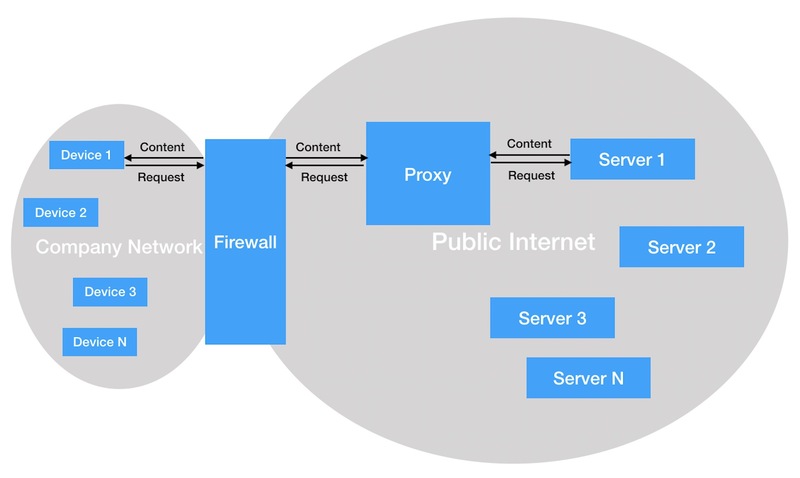 The public Internet server sends relevant website content back to the proxy, which then sends the content to the firewall. Finally, the firewall sends the content back to the requesting device.